Design. What does the word mean to you? For many outside the industry, design is seen as a veneer, something that improves how things appear. As the editor of eSociety, I see in every issue how design does much more, it actually improves our lives on many levels. 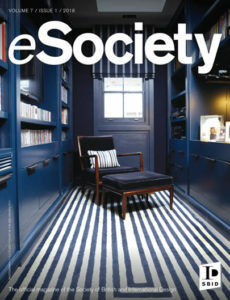 Creative excellence has a positive impact on how we feel and how live, work and learn – every issue of eSociety inspires me about the possibilities of great design and I hope you feel the same. I’m a sucker for a beautifully designed shop so it was thrilling to speak to Carlo Camillo, the Global Director of Store Design & Visual Merchandising at Christian Louboutin Beauté. Read how he translates the exquisite brand values into retail environments on page 14. As the focus shifts towards the 2018 International Design Awards, SBID is given the platform to showcase another year design excellence and creativity. Every year they celebrate the possibilities of design and unite the global design community. You can find out more on the Awards on page 7. To complement the visual inspiration, we always bring you the latest information from industry experts. On page 44 you can discover more about the SBID Colour Council. The panel joins the Education and Healthcare Councils in bringing SBID members the best industry intelligence, empowering you to take decisions based on the latest research. On page 46 you can learn how your business might be affected by the new General Data Protection Regulation rules might affect your business. From the best inspiration to rock-solid business info, you’ll find it all here.Enjoy the issue and get in touch if you have any feedback.